The Guitar Column: Bill Connors | "Never Say Goodbye, Variations on Layla"
Bill Connors | "Never Say Goodbye, Variations on Layla"
The July 1985 issue of Guitar Player magazine was devoted almost entirely to Eric Clapton and this piece, "Never Say Goodbye -- Variations on Layla" was specially commissioned for the included Soundpage. According to Bill Connors who composed 'Variations' and played all the guitar parts, "The session took place at Media Sound in New York. I had trouble hearing the first part back in my headphones, and when I added the middle voice to bars 17 through 22, the chords turned out to be slightly out of tune, giving things an eerie quality. I considered doing it over, but decided that it had a horn-like feel that I liked, so I kept it." Connors used his Charvel Strat-copy equipped with prototype DiMarzio pickups through a Dean Markley tube amp and Marshall cabinets. 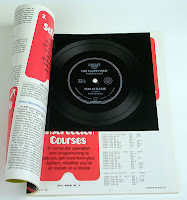 Readers old enough to remember the heady experience of peeling open the outer shrinkwrap cover of a newly purchased record album will also remember the wonderful aroma of the black record vinyl therein. (Don't knock it til you've tried it). Back in the day, circa October '84 til Dec '89, GP's monthly addition of the free Soundpage -- a paper-thin playable record, manufactured by Eva-Tone -- always featured exciting and unique content, often unavailable anywhere else. Replete with that black vinyl smell! It was on the first of these Guitar Player magazine Soundpages that I heard 'The Attitude Song' by a guy called Steve Vai -- blowing my mind and causing me to bust more than a few strings in the process. Check out my earlier Bill Connors article here. Cryptic Message On Analogman Pedal?